1305576519 -This thoroughly revised edition of Mooney, Knox, and Schacht’s text uses a theoretically balanced, student-centered approach to provide a comprehensive exploration of social problems. 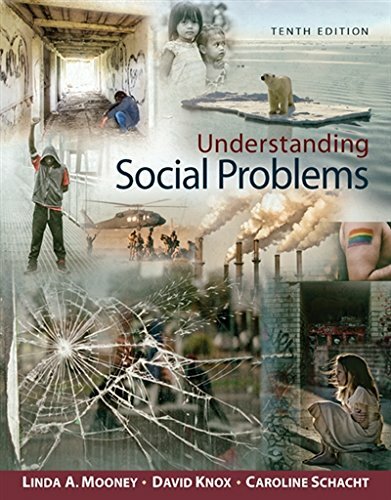 UNDERSTANDING SOCIAL PROBLEMS, Tenth Edition, progresses from a micro to macro level of analysis, focusing first on problems related to health care, drugs and alcohol, families, and crime, and then broadening to the larger issues of poverty and inequality, population growth, aging, environmental problems, and conflict around the world. The social problem in each chapter is framed in a global as well as a U.S. context. In addition, the three major theoretical perspectives are applied to the problem under discussion, and its consequences — as well as alternative solutions — are explored. Pedagogical features such as “The Human Side” and “Self and Society” enable students to grasp how social problems affect the lives of individuals and apply their understanding of social problems to their own lives.